The most successful movie ever made is a story about resistance to immigration. The movie in question is Avatar, a movie that does not have a particularly original story. In large part it mimics Kevin Costner’s Dances with Wolves, simply with the location shifted from the 19th Century American West, with American Indians, to the far future, when we have colonised other planets. The core story runs like this: there is a native population, which carries on its distinctive life with all the joys and sorrows that intelligent life is usually suspect to. Into this settled environment comes an invasive force which is aggressive and disruptive, and which threatens the existing order. Through a process of struggle and growth the native community comes together in order to resist the invaders and repel them. The status quo ante is restored, leaving behind a strong residue of community cohesion, identity and integrity. 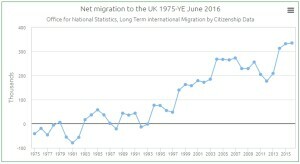 It is unarguable that the native population of Britain has experienced a huge influx of migration, with an especial acceleration of immigration following the election of Tony Blair in 1997 (see chart). It is therefore unsurprising that this has caused a great deal of concern, and that this concern has been expressed in both healthy and unhealthy ways. My question would be – is the situation in Britain analogous to the one portrayed in Avatar, and all the other great stories about indigenous resistance? After all, whenever indigenous resistance is seen anywhere else around the globe, it is portrayed by our media as heroic. When we read of tribes in the Amazon seeking to preserve their environment from developers we cheer them on. The only native tribe that is never cheered on is that of the white Anglo-Saxons. As with Avatar, the white Anglo-Saxon tribe is always the villain doing the immigrating and disrupting other cultures, it is never the one being disrupted. Historically this is perfectly accurate. Despite the liberal shibboleths about Britain always having been a nation of immigrants, we are far more accurately characterised as an emigrant culture. Stories which portray the invaders as white males are simply describing what has so often happened. So are we simply now getting our ‘come-uppance’? Having invaded so many areas around the world, is it simply now our turn to be invaded by others? Perhaps. What I wonder is whether there is anything left worth saving in our indigenous culture; first and foremost I wonder whether any sense of the British inheritance of Christianity can be salvaged. In Avatar, the invading culture is driven by economic interests. There is a substance called ‘unobtainium’ which is ridiculously named and ridiculously valuable. 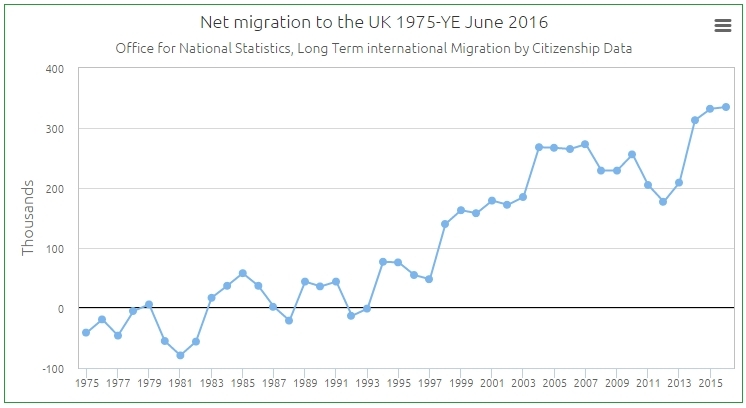 Economic interests have also been the principal driver behind immigration into Britain (alongside, if Andrew Neather is to be believed, some deeply cynical electoral manipulations by the Blair administration). I cannot help but see this reaction as a healthy one, and a spiritual one – which again links in with stories like Avatar. The resistance to the invading forces can only ever work when there is a spiritual element involved; that is, when the resisting culture is able to call upon a greater power to aid their purposes. So how might such a spiritual element apply in the present British context? In Avatar, the hinge of the story is the conversion of someone from the invading culture to the native culture. The invader comes to see the higher quality of the host culture, that it provides a richer and more fulfilling path for their life. Most especially, the spiritual dimensions of life are a key element driving the conversion – the invader comes to see that their own culture is explicitly lacking in a vital aspect of life. At present, in Britain, the domestic ‘host’ culture could not fairly be described as a spiritual one. Our cynical society, knowing prices but not values, offers very little that might appeal to the deeper parts of human nature. We offer an environment which makes it fairly straightforward to make money, if you have the luck or the advantages to develop such opportunities, but we offer little else. Our cultural elite are blind to such considerations, and have been so for many decades. As such, it is not simply that they cannot develop appropriate and relevant solutions to the immigration crisis, it is that they would not be able to recognise such an appropriate solution even if one were to be presented to them already formed. Unless spiritual aspects are taken seriously by our government, all those elements which depend upon such spiritual aspects will pass by unseen. Those elements are community cohesion, the practice of particular virtues, all that makes a common life harmonious and viable. Without the spiritual glue that binds a community together there is no basis for resistance to an invading community. The unobtainium is therefore easily obtained. All that will happen is that the invading spirituality, showing itself to be stronger than the native spirituality, will supplant that native spirituality. To many minds this will seem unconcerning. If the economic processes could continue, what would it matter if the idols in the corner of the living room are named one thing rather than another, that the holy books are written in one language rather than another? Who cares? That is the voice of the blind, one that cannot contemplate the consequences of their own myopia. In the end, to be concerned about immigration is to be concerned with spiritual issues; ultimately, our concerns are with what is ultimate, what is of most value. Any culture coheres around a common awareness and appreciation of what is held to be most important; in this society we have historically called that God, and we have developed the language for understanding those ultimate values through our Christian inheritance. It is not wrong to be concerned about immigration; on the contrary, to be concerned about immigration is to be concerned about the most important human issues that there are. Now it may well be that our culture has decayed too far to be rescued, that all is lost. That would be a different story to the one told in Avatar, and so many like it. I rather think that there is still some spiritual life in our nation, and it is beginning to wake up. For my part I shall do my very best to assist that process! This entry was posted in church, crisis, politics by Elizaphanian. Bookmark the permalink. At root the problem is this: ‘England is perhaps the only great country whose intellectuals are ashamed of their own nationality.’ (George Orwell). It mainly, I believe, this attitude that allowed the explosion (no pun intended) of immigration under Blair and this attitude is so deeply engrained (Orwell was writing over 70 years ago) that it will probably never be fully reversed. The only way to tackle the problem of mass immigration (and it is a problem) is to do so on practical grounds: ie, how can a welfare state and civil society function if it is overwhelmed by those who have not contributed to it. Any other objections are liable to be condemned as that secular version of the Unforgiveable Sin: racism. Did you see Avatar’s better contemporary, District 9 — science fiction as social satire | Khanya — less simplistic and more nuanced than Avatar, though also about immigration?